As a professional graphic designer for sixty years, I’ve produced more than five hundred posters that in a variety of ways inform, persuade, or decorate their subjects—that all comes under the heading of good professional practice. Glaser picked nine of his favorite posters from the book to share with us. Art Is Whatever, School of Visual Arts, 1996. Cooperstown Summer Music Festival, Cooperstown Summer Music Festival, 2012. We Are All African, School of Visual Arts, 2005. Southampton Writers Conference, Stony Brook Southampton, 2006. Milton Glaser: Posters, Onondaga Community College, 2009. Milton Glaser: Drawing Is Thinking, Department Store of Belgrade, 2010. AIGA NY 30, AIGA, 2012. PostPast, State Hermitage Museum, St. Petersburg, Russia, 2014. 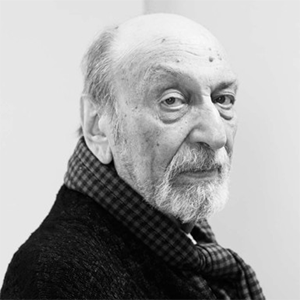 Milton Glaser is among the most celebrated graphic designers in the United States. Among many awards throughout the years, he received the 2004 Lifetime Achievement Award from the Smithsonian Cooper-Hewitt, National Design Museum, for his profound and meaningful long-term contribution to the contemporary practice of design.